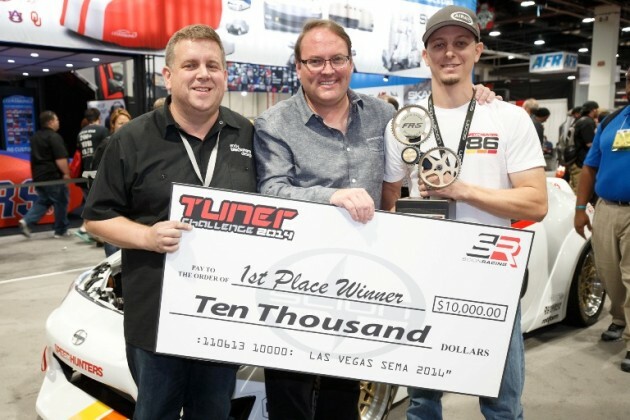 Speedhunters reigned victorious in the 10th annual Scion Tuner Challenge at SEMA this week with their Maximum Attack FR-S. The Speedhunters team consisted of Andy Blackmore, Rod Chong, and Keith Charvonia, all of whom had previous experience tuning cars and utilized it to walk away with the $10,000 first prize. The Maximum Attack FR-S was inspired by the style of older TRD, TRA Kyoto, Trans-Am, and muscle cars. The Maximum Attack boasts a special one-off bodykit designed by Kei Miura, KM4SH overfenders, and custom hood louvre from Hot Rod Central, all of which combine to achieve the desired retro effect.